The Los Angeles Lakers are on the verge of completing their worst season ever — no Kobe Bryant, almost no promising youth, and little hope for the immediate future. Team president and ultimate boss Jeanie Buss remains as bright and optimistic as the California sun — but would she fire her brother Jim, VP of basketball operations, for failing to keep up his end of the bargain? The only thing thicker than blood is NBA championship gold. 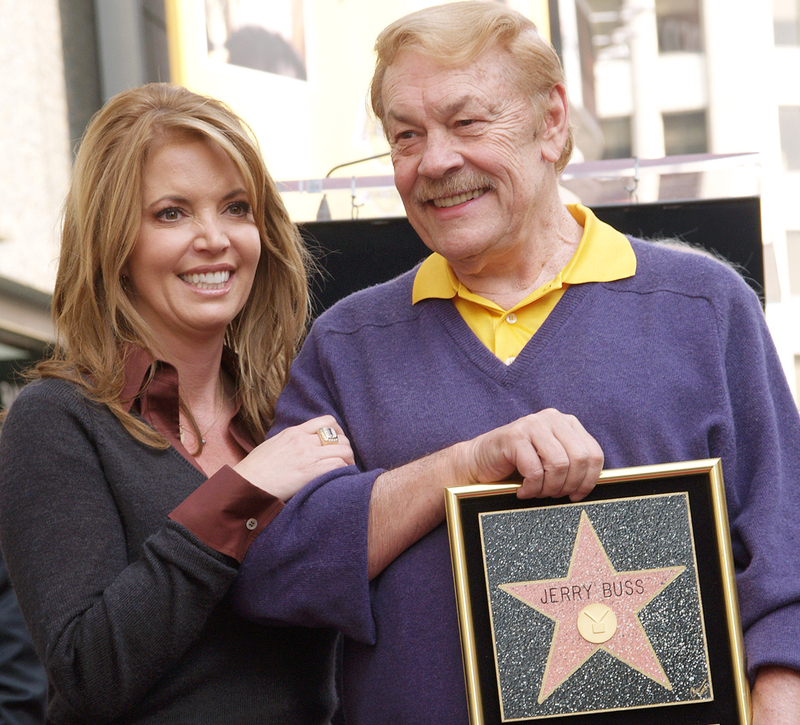 Dr. Jerry Buss drew up a plan before his death. His daughter Jeanie would run his team, the Los Angeles Lakers, acting as president, overseeing business operations, and representing the Lakers on the NBA’s Board of Governors. Her older brother Jim would control basketball operations. The plan was flawed from the start. First and foremost: Who would really be in charge? Jeanie Buss is the boss. She’s also not. She is the decision-maker, the final hammer, the decider within the organization. Even when it comes to basketball operations, she has veto power over her brother Jim and general manager Mitch Kupchak. She is their superior. But she does not, and says she will not, execute that veto power. She has empowered them to do what it takes to win. This is something she’s said over and over again. Buss is and is not the boss because she still answers to someone: her father. Even now, more than two years after his death, with the Lakers in the midst of a historically unprecedented season of struggle, Jerry Buss still dictates policy. It was his decree that Jeanie would run the business side with Jim handling basketball. And Jeanie — loving, adoring daughter that she is — will not defy her father. Not yet, anyway. Then there are the trophies. The 10 NBA championships are arranged in chronological order atop a desk overlooking the Lakers practice court. About five or six years ago, when Buss first moved into her father’s old office, she shut the blinds to thwart the fluorescent lights that flood the court. One day, Phil Jackson, Buss’s boyfriend since 1999 and then the Lakers head coach, opened the blinds. For added motivation, the players should see the trophies, he said. Buss recognizes that the Larry O’Brien Championship Trophy is magnetic to anyone who hasn’t actually won one. When Dwight Howard was traded to the Lakers in August 2012, he zipped here from his introductory press conference to marvel at the trophies. “Those are real?” he asked her with predictable Dwight Howard childlike awe. Buss, who is 53, is tall and blonde, a California archetype. She dresses like a Shark Tank judge: Her clothes are fitted and monochromatic in a way that communicates power. She wears a black, slim-cut blazer; a white shirt with two, maybe three buttons undone; and a black skirt hemmed just above the knee. She stows her cell phone in her bra. As if we needed further reminder as to who’s in charge here, Buss sports the 2002 championship ring on her right middle finger — even though, she says, championship rings are “the most gaudy, obnoxious things.” So hideous that they are gorgeous, she says. She can’t resist. One glimpse of the ring brightens her day. These are challenging times for the Los Angeles Lakers. For the first time since the Buss family became the owners, the team has missed the playoffs in two consecutive seasons; national TV games have been cut from the schedule; ratings are down; Kobe Bryant, their 36-year-old star, suffered a season-ending injury — again; everything from their style of play on the court to their front-office structure has been probed, criticized, and lampooned. Lakers fans, from the foulest Twitter troll to Magic Johnson, have publicly pleaded for Jim Buss, the embattled vice-president of basketball operations, to resign. All this has left Jeanie Buss, the boss, a little rattled; it’s why a reminder of past glories — in this case, a gaudy, obnoxious championship ring that’s more than 10 years old — can brighten her day. The 2014-15 season began on an inauspicious note when prized rookie Julius Randle, selected seventh overall, the Lakers’ highest draft pick since nabbing James Worthy with the no. 1 pick in 1982, broke his leg on opening night, ending his season. Focus soon turned to everything the Lakers were doing wrong: Kobe Bryant’s usage rate; Kobe Bryant’s shot selection; head coach Byron Scott’s enmity toward the 3-point shot and the franchise’s perceived ambivalence toward advanced analytics.1 When a torn rotator cuff ended Bryant’s season in January, the Lakers, now embedded near the bottom of the Western Conference, could sensibly turn their attention to the NBA draft lottery on May 19. Lost seasons such as this one are often defined through some sort of bizarre controversy unrelated to the game. The 1993 New York Mets (59-103 record) had Bret Saberhagen spraying bleach at reporters and Vince Coleman scattering firecrackers like sunflower seeds. The 2009-10 Washington Wizards (26-56) were notorious for a gun incident in the locker room. The 2014-15 Los Angeles Lakers (20-54) have a goofy postgame interview. On February 22, after the Lakers snapped a seven-game losing streak with an overtime win over their old rival, the Boston Celtics, Nick Young, Jordan Hill, and Carlos Boozer celebrated with perhaps a little too much enthusiasm for a last-place team. Coincidentally, Kobe Bryant was booked on Jimmy Kimmel Live the following evening. Kimmel, of course, replayed the footage for Bryant, who remained expressionless throughout. “Would that happen if you were there?” the host poked. “Would there be a celebration?” Bryant, relishing the role of fun-crusher, fixed his tie. He said nothing. He seethed. Jeanie Buss watched the Celtics game and Bryant’s talk show appearance. She anticipated Bryant’s reaction. It reminded her of Magic Johnson’s NBA debut, when he smothered Kareem Abdul-Jabbar with a bear hug after Kareem beat the San Diego Clippers with a sky hook at the buzzer. Afterward, the ornery vet scolded the rookie: Listen, we have 81 more of these games. Buss thought this recent postgame celebration was charming and endearing. She saw teammates connecting in a way that breeds camaraderie. It made her hopeful that the youngsters on the roster will develop together as part of the Lakers’ future. Still, she’s wary of getting attached. She looks hurt. Empathy is not an enviable trait in her business. She cut her teeth in TeamTennis, and later roller hockey, volleyball, and soccer — fringe sports organizations with long hours and small staffs. Everything was smaller: smaller ticket prices, grosses, sponsorship deals; she’d treat sponsors like precious gems when they came aboard. She learned the business of sports, marketing and promotion, how to deal with agents. She learned the importance of every customer. She also managed the Forum from 1991 to 1995, a 365-day-a-year kind of gig. Life was a blur. She booked rock concerts and tennis exhibitions. Depending on the night, Frank Sinatra or Prince or the Prince of Monaco would be in the house. There were relationships with athletes: Jay Wells of the Kings, John McEnroe, and a quickie wedding to Olympic gold-medal-winning volleyball player Steve Timmons.4 Her life was worthy of a sitcom: The Mary Tyler Moore Show meets Eddie. She got divorced after three years of marriage, then posed for the May 1995 issue of Playboy5 (the shoot took place in her father’s office) right around the time she attended her first Board of Governors meeting, as the Lakers’ alternate governor.6 After toiling in second-class sports, absorbing the family business, she was finally poised to lead it. In 1999, Jeanie Buss was named the Lakers’ executive vice-president of business operations. The Lakers front office was a paragon of stability and competence throughout the 1980s and 1990s: Jerry West ran the show, Mitch Kupchak was his apprentice, and Ronnie Lester led scouting. Gene Tormohlen worked for the Lakers as a college scout for 28 years. He remembers Dr. Buss sitting down with him for a chat every year at training camp. Now in his late seventies, Tormohlen lives in Georgia, where he still follows the team. An unflattering narrative was being sculpted. Elsewhere in the SI piece, a business associate of Dr. Buss described Jim as “easily distracted, and has no instinct for the jugular.” Peter Vecsey of the New York Post once called him a “professional party animal.” He became the Fredo to Jeanie’s Michael Corleone. In the public’s eye, Jimmy was, and still is, a product of entitlement — nepotism gone wrong, a grown man in a baseball cap. His presence and influence within the organization are conveniently ignored when the Lakers front office pulls off a caper such as the trades for Pau Gasol and Trevor Ariza or the rescinded Chris Paul deal. Yet he is held liable for each blunder: hiring Rudy Tomjanovich; trading Lamar Odom in an apparent salary dump; hiring Mike Brown without Kobe Bryant’s input; trading two first-round picks for Steve Nash, who played 65 games in three seasons for the Lakers before retiring last month. After more than 30 years of getting their way, 10 championships, and nearly every coveted superstar, Lakers fans need a punching bag to answer for these lean years. And it’s not going to be Jeanie, the little sister the city grew up with, nor general manager Mitch Kupchak, who apprenticed under the revered Jerry West. The former horse trainer who rarely appears at Staples Center and is heard from only about once a year is the perfect fall guy. Jeanie Buss wasn’t associated with personnel decisions until head coach Mike Brown was fired five games into the 2012-13 season. With her father in the hospital undergoing cancer treatment, Jeanie didn’t want him to go through the stress of a coaching search. She thought her longtime partner, Phil Jackson, then 18 months into a retirement, was the obvious short-term replacement. 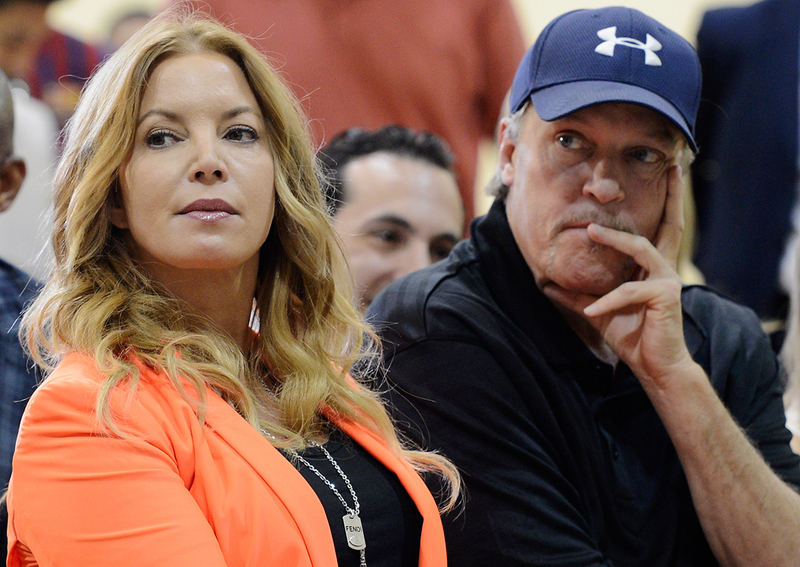 Jim Buss approached his sister about talking to Jackson — the two men had clashed in the past. Following a meeting with Jim Buss and Kupchak, it appeared that Jackson would return to the Lakers. To Jackson’s understanding, it was his decision to make, and he had 48 hours to make that decision. The next night Kupchak called Jackson to inform him that the team had hired Mike D’Antoni; Jim Buss has said D’Antoni was Dr. Buss’s choice. 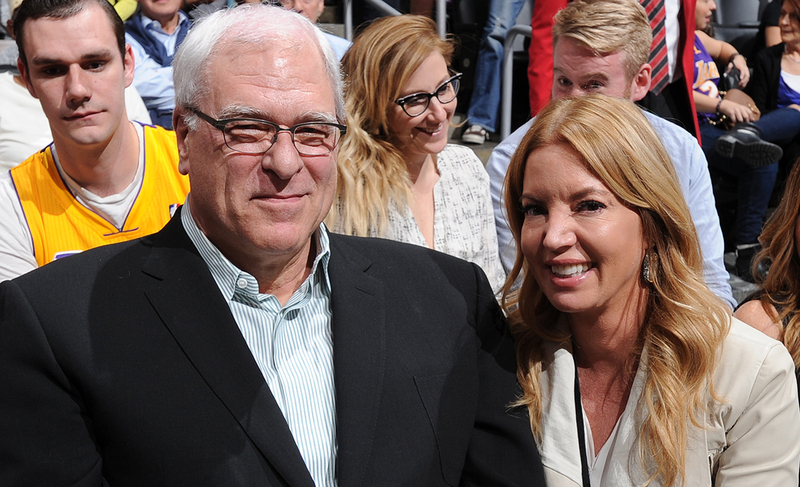 “I never had that conversation with my dad,” Jeanie Buss says. A few years ago, Jeanie Buss signed up for a stand-up comedy course even though committing three hours every week was close to impossible. She lasted two classes, but she learned a lot in those two classes. For starters, Buss jokes, she found out she isn’t funny. She also discovered that the best way to tell a story is to infuse it with personal details, her own point of view. And that if you find an anecdote that works, use it over and over and over again. Humor and personal details can add a human touch, and an important part of Buss’s job is standing in a room full of people and making them feel at ease during high-stakes negotiations. Buss’s management style differs slightly from her father’s approach. Her personality is not as flamboyant, but, like him, she isn’t a micromanager. She listens, offers counsel or an opinion, and has complete trust in her employees to do the job she hired them to do. I’m here if you need my help is a familiar refrain. Building coalitions, hearing all voices, forming consensus, empowering workers: That’s her style. Buss also deviates from her brother on the issue of revenue sharing. “Fifty million dollars extra per year just kind of went out the door,” Jim Buss told ESPN’s Dave McMenamin in April 2012 regarding the league’s new revenue-sharing plan, which was introduced in the 2011 CBA. Teams must now annually contribute a set percentage of their total local revenue. For the 2013-14 NBA season, the Lakers, flush with cash from their 20-year $3 billion deal with Time Warner, contributed a league-high $49.6 million to revenue sharing; the team made $100.1 million in basketball operations, also a league high. Jeanie Buss is publicly optimistic that the Lakers can turn things around. Though unfamiliar with the nuances of the game, she says, she trusts the vision that her brother and Kupchak have for the team. More than anything, she believes in the brand. Back in her office, she points to a large painting hanging on the far wall. “Let’s see how good you are. Can you name all the guys?” she asks. The painting features seven Lakers in their Sunday home white uniforms walking in unison in front of a white background. I nail the first six — Brian Shaw, Robert Horry, Kobe Bryant, Shaquille O’Neal, Rick Fox, and Derek Fisher. And is that Samaki Walker? “That’s not Samaki Walker,” Buss says. We moved toward a bookcase in the corner. A Superman figure clock from the wall. A Wonder Woman mug resides on the bookcase. Buss loved comic books as a kid and was a regular at Comic-Con in the 1970s back when it was held at the El Cortez Hotel in San Diego. While her brothers all read Marvel books, Buss was a DC fanatic — Superman, Supergirl, Wonder Woman, and Batman were her favorites. She loved when comics explored the relationship between heroes and villains, archenemies such as Superman and Lex Luthor. She’s even a Smallville buff. Her current favorite television show, The Walking Dead, is also based on a comic book. And though Buss savors a good zombie scare, the show’s themes are more appealing to her. Thomas Golianopoulos (@Golianopoulos) is a writer living in New York City. He has contributed to the New York Times, BuzzFeed, Vibe, and Complex. I was skeptical about this anecdote, but a quick Google search revealed that “Thriller” premiered on December 2, 1983 — the same day Magic Johnson dislocated his right index finger in a home loss against the Dallas Mavericks. At the reception, held a few months after the wedding, her father showed up with two dates. Buss later maintained that he was referring to scouting the top prospects in the draft. Speaking to ESPN’s Ramona Shelburne in December 2014 about the Jackson-D’Antoni flap, Jim Buss said, “It hurts me every day how this all went. I’ve apologized to Jeanie.” Jackson is now president of the New York Knicks. The Lakers declined to make Jim Buss available for comment. On the issues of the day, Buss supports legalized gambling, is anti-tanking, pro–lottery reform (“I think every business needs to plan and forecast 12 months, 18 months, 24 months away, and with something like a lottery, there is so much that you can’t control”), and defers to the coach and training staff when it comes to resting players. The six Buss siblings — Jeanie, Jim, Johnny, Janie, Joey, and Jesse — own the team as a collective, meaning they are not individual owners. Four “yes” votes would be required if they were to ever sell the team. The Buss family owns 66 percent of the team. AEG chairman Philip Anschutz (27 percent), Patrick Soon-Shiong (4 percent), and Ed Roski (3 percent) have minority stakes. Local TV ratings fell 49 percent for the 2013-14 season. As of February 2015, they were down 25 percent from that point last season. Philadelphia receives the pick if it falls outside the top five.